Ask any adult about their clearest school-day memory and their answer will almost certainly include descriptions of soggy spaghetti, slimy sausages and lumpy mash. Ask any child what their favourite part of the school day is and the answer will probably be lunch. So if lunch is a highlight, why is it notoriously terrible? With an air of optimism, we believe, or sincerely hope, this could be a thing of the past. Parents and children the length of Britain are indebted to tireless campaigner Jamie Oliver and thousands of dedicated school and government board members and dinner ladies, for ensuring that greasy gruel is a thing of the past. Although Jamie laments that his campaign has not been an overriding success, it has certainly brought widespread awareness of the issue to the general public. Speaking to the Radio Times about his campaign for nutritional school menus, Jamie said: “I admit I haven’t succeeded, mainly because I haven’t single-mindedly gone for it. Ten years on from the School Dinners campaign, Jamie has embarked on a new project to rid children’s diets of excess sugar. Good luck Jamie! The Quattro team supports you all the way. We understand that good nutrition leads to better focus in class, improved grades and a healthy well rounded child. We take our role as a school food supplier very seriously and our food and menu development for schools is designed with Jamie’s recommendations in mind. One of our development chefs was instrumental in driving the menu changes through the education sector following Jamie’s original ‘turkey twizzler’ campaign, and has brought his experience to the Quattro kitchen. We all know that children perform better when their bodies and minds are powered by a balanced and nutritious diet. Every parent and teacher across the world will tell you that brain power, concentration and general wellbeing are unequivocally improved when kids eat decent meals, with lower fat, sugar and salt content. We also know it’s not easy to get fruit and veg into a child, but there are so many ways of making healthy food appealing and delicious. One of the key influencing factors is to create a love of food and an understanding of where it comes from. 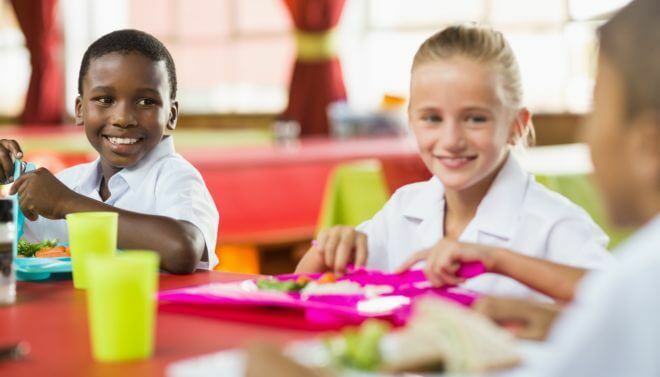 Recently the British government has put in place some interesting recommendations to schools, including The School Food Plan from the Department of Education, designed to support head teachers improve food in school. Improving productivity and mood is something that all parents aspire to and at Quattro we offer school caterers the highest quality food products to help them make our kids smarter, healthier and happier.